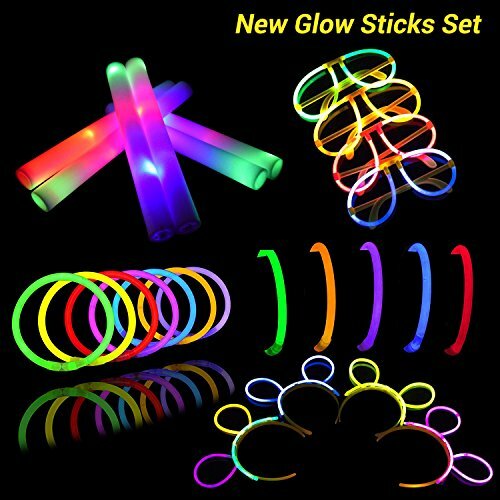 LifBetter Glow Sticks Set, 12 PCS Mixed Colors LED Foam Sticks and 30 PCS Glowsticks with Glasses and Hair Hoops, One Set for Family Party Favors Supplies by LifBetter at Saltarines Quito. MPN: AM030. Hurry! Limited time offer. Offer valid only while supplies last. New Set Family Party Choice: This bulk foam glow batons pack features 12pcs 16" LED foam sticks & 30pcs 8" glow sticks in assorted colors with 30 connectors, 3pcs glasses and 3pcs hair hoops. One price, more economic. Mixed Colors Glow Sticks: Come with 3pcs glasses and 3pcs hair hoops, it is magic and creative to make different styles you want. Bend and shake for a bright and brilliant glow that will last more than 5 hours for extended use.